I love zucchini fritters, but I find that they are hard to get just right because of the moisture from the actual zucchini. 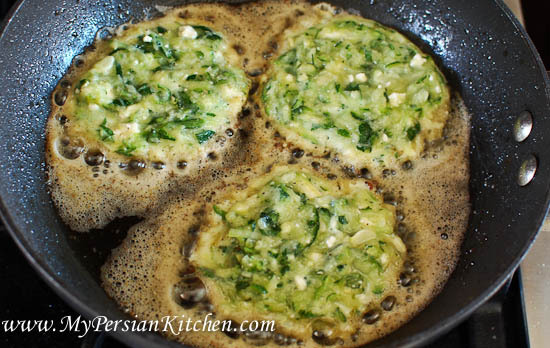 To me Zucchini Fritters are just like mini Zucchini Kuku, the only difference is that they are a bit more labor intensive and require more oil for the frying part! Our friend Joanna grows delicious vegetables in her garden. 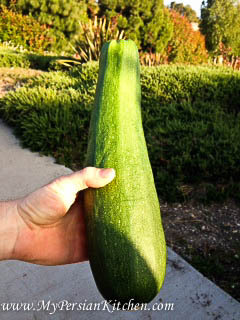 She gave us a HUGE zucchini a little while ago and I knew exactly what I was going to do with it! When I say huge, I really mean huge! Look at the size!!! The inspiration for this recipe came from a Joy of Cooking Vegetarian cookbook that my cousin Essi gifted me many years ago. 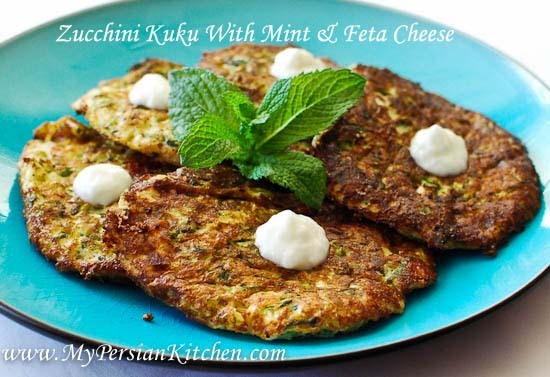 I love the addition of flavor that mint and Feta cheese bring to these fritters. I hope you will enjoy them as much as we did! 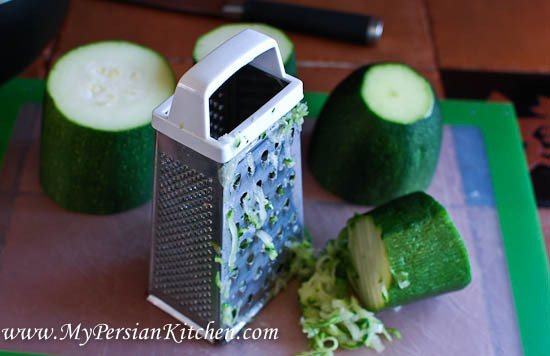 Place grated zucchini in a colander over a bowl. Sprinkle with some salt, mix well, then allow to sit for about 20 minutes. 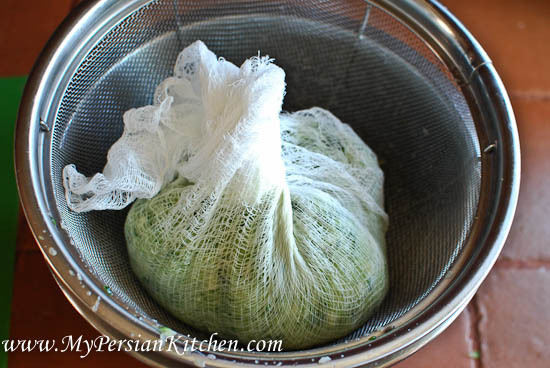 Place zucchini in a cheesecloth and twist to remove all moisture. 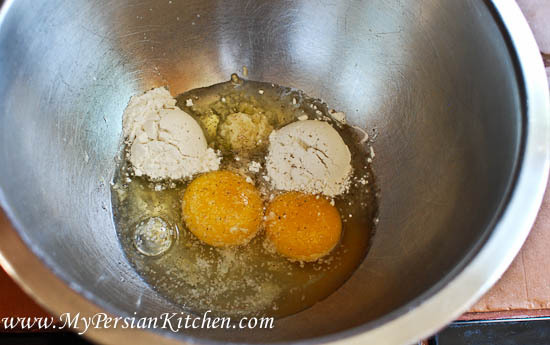 In a bowl mix together eggs, garlic, flour, salt and pepper. Make sure that the batter is smooth with no flour lumps. 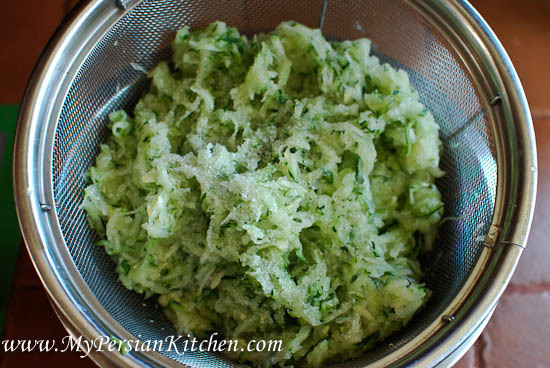 Add grated zucchini and chopped mint then mix well. 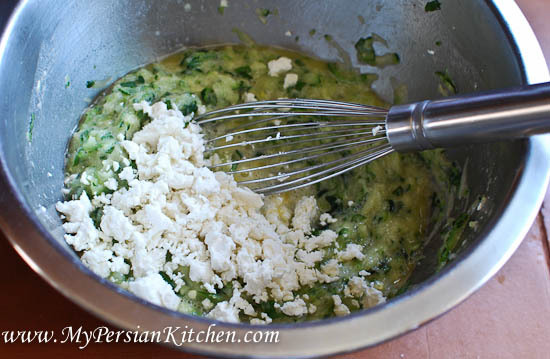 Lastly, add the Feta cheese and mix again. 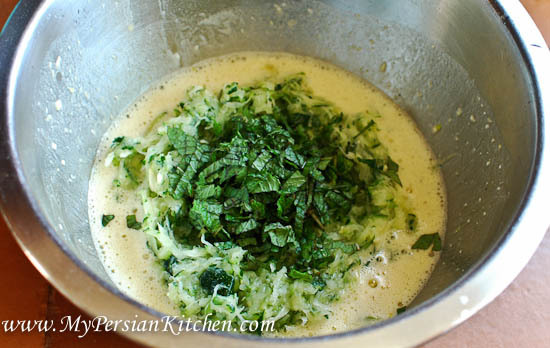 In a frying pan add some oil and once hot ladle in some of the zucchini batter. Cook in batches making sure that the fritters are not crowded. Once each fritter is cooked place in a plate line with a paper towel. 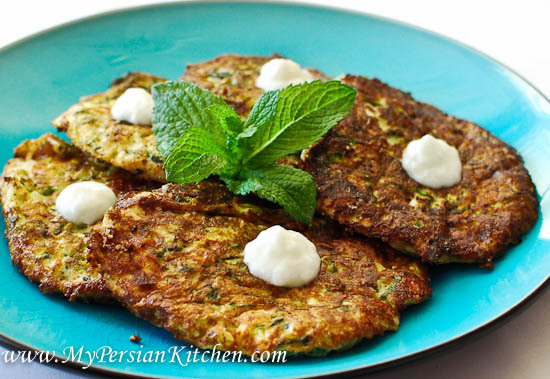 Arrange fritters on a plate and top each with a dollop of yogurt! Enjoy!